Everyday aesthetic experiences and concerns occupy a large part of our aesthetic life. However, because of their prevalence and mundane nature, we tend not to pay much attention to them, let alone examine their significance. Western aesthetic theories of the past few centuries also neglect everyday aesthetics because of their almost exclusive emphasis on art. 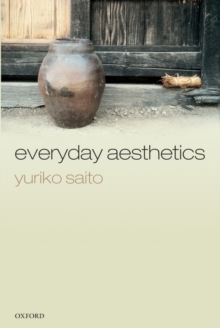 In a ground-breaking new study, Yuriko Saito provides a detailed investigation into our everyday aestheticexperiences, and reveals how our everyday aesthetic tastes and judgments can exert a powerful influence on the state of the world and our quality of life. By analysing a wide range of examples from our aesthetic interactions with nature, the environment, everyday objects, and Japanese culture, Saito illustrates the complex nature of seemingly simple and innocuous aesthetic responses. She discusses the inadequacy of art-centered aesthetics, the aesthetic appreciation of the distinctive characters of objects or phenomena, responses to various manifestations of transience, and the aesthetic expression of moral values; and she examines the moral,political, existential, and environmental implications of these and other issues.